You are here: Home / Misc. / Education / What Skills Does Music Develop? What Skills Does Music Develop? (ThyBlackMan.com) It is said that music keeps students busy, provides a place to learn or sharpen their talents and skills. But, it also plays a significant role in their mental growth, social and other skill-sets. 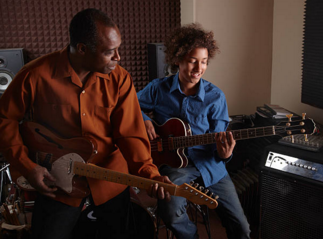 In case you suspect or feel that your child is interested in learning music, make sure you enroll them in a school that offers music lessons like Muse academy. Learning music can help them improve their social, physical and emotional well being. In this article, we will look at other skills that learning music helps to develop. Below are skills that students develop when learning music. Studying music improves the development of spatial intelligence in students. This helps them to perceive the world more accurately and with the aid of mental pictures. Spatial intelligence is very helpful when it comes to advanced mathematics. For a student to read music, they need to learn quarter, half, and whole notes, which are actually fractions. So, when a music student spends time and learns about rhythm, he or she has essentially learned to count. The student isn’t counting numbers, per se, but is using their logic to count out bars and rhythms, methodically working their way through the piece. Children who study music usually have a larger vocabulary. They also posesmore advanced reading skills than their counterparts who don’t participate in music. Young students taking keyboard lessons have a much greater abstract reasoning capacity than that of their peers. These reasoning abilities improve with time and sustained music training. Their spatial-temporal performance improves very significantly. As students are allowed to create and express themselves, their creativity levels become more sharpened as music students. It allows them room for ‘outside-the-box’ kind of thinking.The originality and flexibility are benefits of music this very same education because these are the main components of the innovation and creativity that music requires. Well known is the fact that communication,teamwork, creativity, and critical thinking are competencies and skills necessary in their work, regardless of the field they will end up working in. of whether they are working in music or in other fields. Music in our schools gives students a way to relieve stress. Because of its therapeutic properties, these children get to relax and let the troubles of the day slip away, leaving them refreshed and rejuvenated.We all know that listening to a favorite artist or song can lift a mood and relax us. The same goes for creating music. It gives kids a great release allowing them to immerse themselves in something that’s fulfilling and calming. I know that no matter how stressed I was in school, I would always come out happy and relaxed after choir practice. Percussion, and certain other instruments help children develop better motor and coordination skills. The reason is because they require simultaneous movement of the hands, feet, and arms. Students who study or play an instrument get to learn a lot about dedication, discipline, and the fruits of hard work. They are able to creatively come up with ideas and work at them till their fruition. Music aids behavioral and emotional maturity in students. It allows them to see projects through by thinking and working together as a team. Music encourages teamwork. The students learn that no single aspect of music; voice or instrument, can work best independently. They learn how to corporate, put their thoughts and ideas together and work as a team. For a child with learning disabilities or dyslexia, music lessons are of great benefit. This is also true for children who tend to lose focus in a noisy environment. Music also helps Special needs children to find a way to communicate and open up in cases where they may otherwise struggle to do so. Music therapy after-school programs are increasingly being implemented to benefit students with disabilities. Children who study music usually have larger vocabularies. They also poses more advanced reading skills than their counterparts who don’t participate in music. Making music is very involving. Other than voice and fingers, there is the simultaneous use of other senses; ears, eyes, large and small muscles. When playing an instrument for example, the student must read the music, play the instrument and listen to the sound being produced. This kind of attention and coordination not only sharpens them musically, but it also benefits the students in other subjects, benefiting them greatly when it comes to formal learning. This stimulating, integrating activity definitely goes a long way in improving learning. Music involves listening to yourself and to the rest of the ensemble. Musicians need to hear tempos, dynamics, tuning, and harmonies. This helps auditory development in the brain. Music can improve your child’ abilities in learning and other non-music tasks. The obvious and direct result is the ability to sharpen their musical skills. Playing an instrument, singing, composing or even directing. It is very common to see students transform their lives using their newly acquired or polished skills. There are a number who have even started earning an income from these skills they acquire from a very early age. Whether in a private music school or a public school, it is important to encourage students to engage in music and see them benefit from these and other skills that can improve their lives in a multitude of ways.